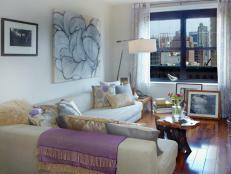 Sarah Raskin and John Kerl loved the luxury of having a bonus room, especially in a New York City apartment. 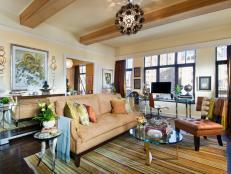 But soon it would need to serve as both a guest bedroom and baby nursery. 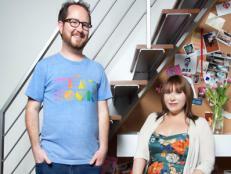 See how this family makes the most of their small space. 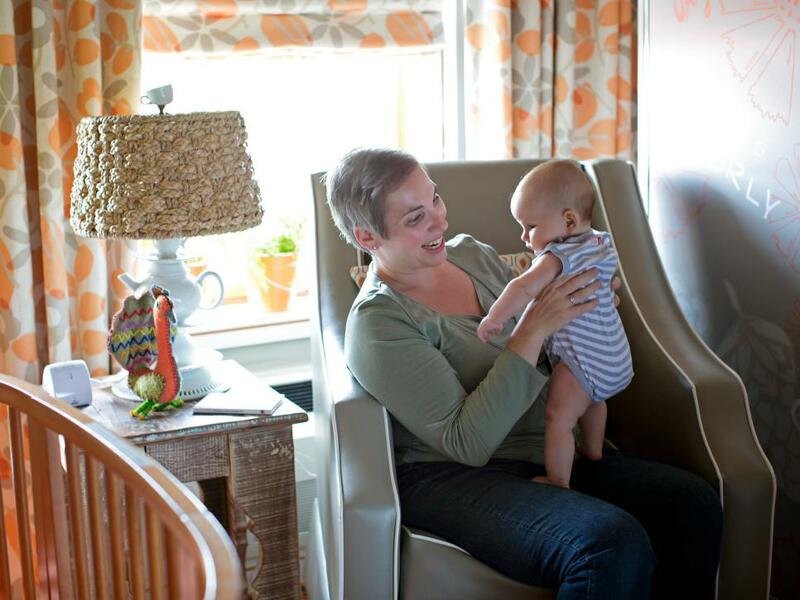 Sarah Raskin's bonus room was redesigned as a nursery/guest room for her daughter, Orly, and visiting friends. 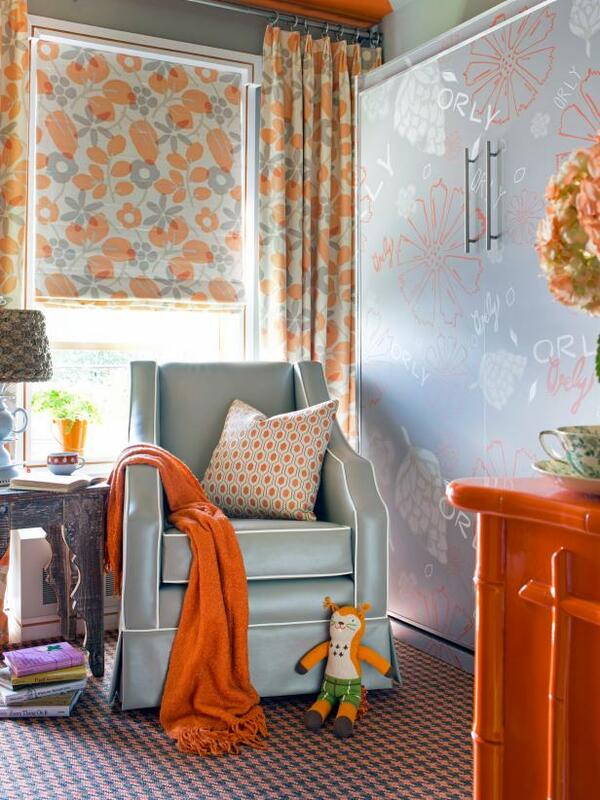 To keep the room applicable to adult guests and for her young daughter, the room was painted taupe then accented with bold shades of orange. 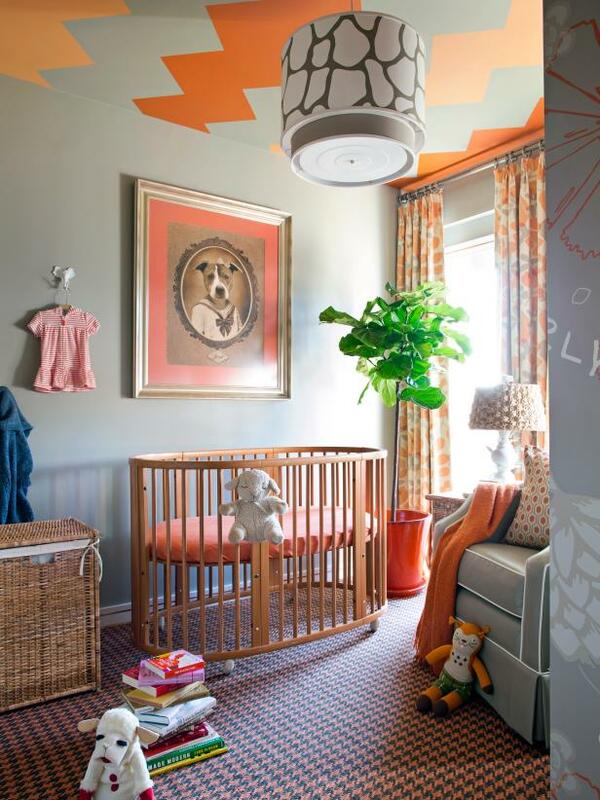 In its new state, the nursery/guest room is full of energy from touches of orange against a neutral taupe backdrop to layered patterns and child-friendly greenery. The addition of a painted zigzag pattern to the ceiling gives Orly something stimulating to look at while lying down in her crib. 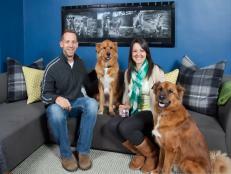 To pay homage to Sarah and John's first baby — rescue dog Scout — they chose a houndstooth-check pattern for the area rug. 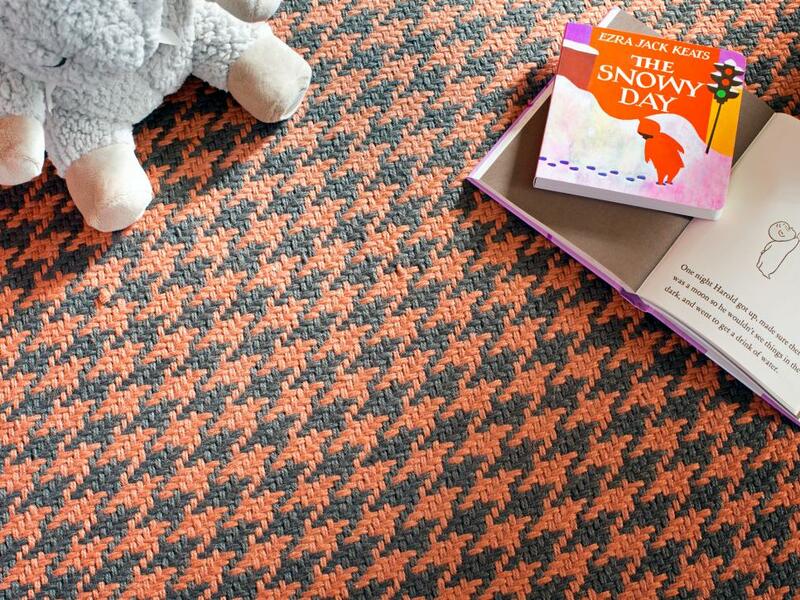 In keeping with their preference for all-organic materials, they selected the rug for its woven-grass construction. 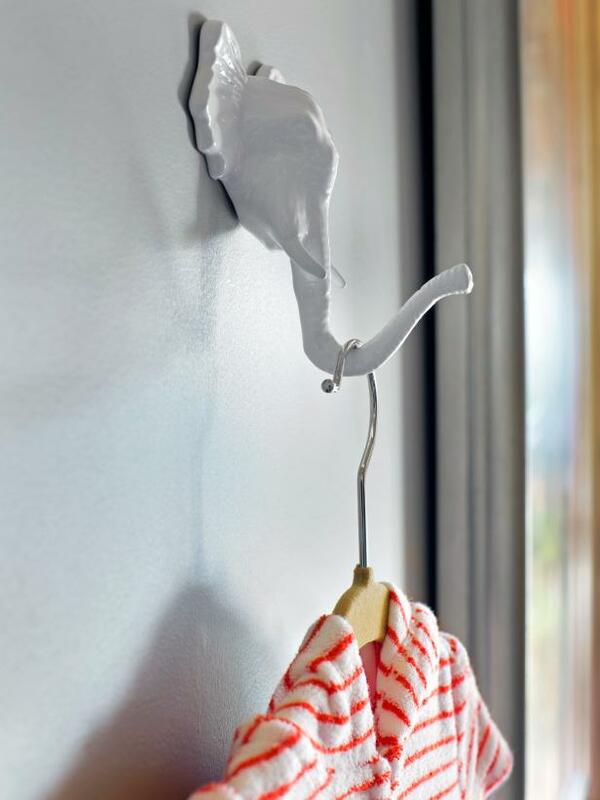 White ceramic hooks in the shape of animals such as elephants and giraffes were attached to the wall a few feet from Orly's crib. 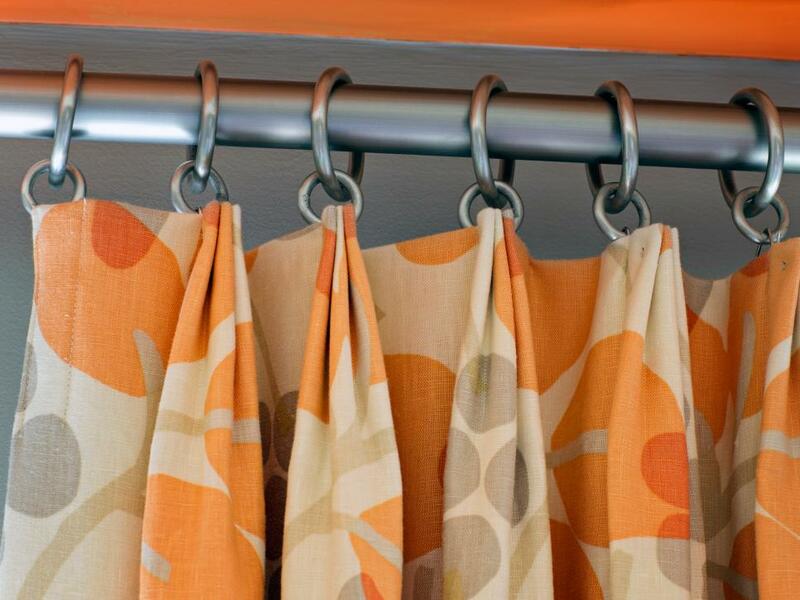 This allows Sarah and John to keep her outfits out and also have them double as decor. 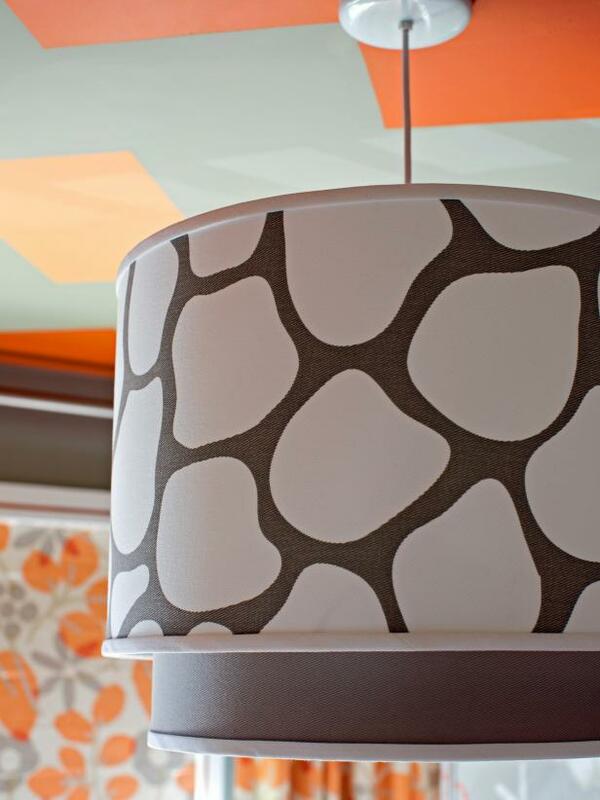 For proper lighting at night, the couple added a graphic pendant featuring a pebble pattern to the center of the room. The linen construction and white plastic diffuser along the bottom aid in softening the light, casting a flattering glow throughout the space. 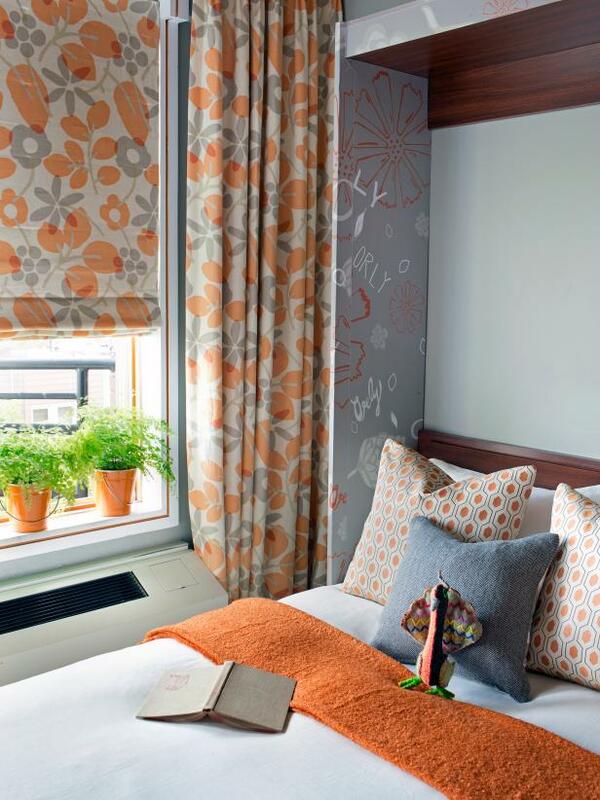 Since the room is intended for use as a nursery for Orly as well as a guest bedroom for overnight visitors, it was important that the drapery fabric be transitional enough for babies and adults. 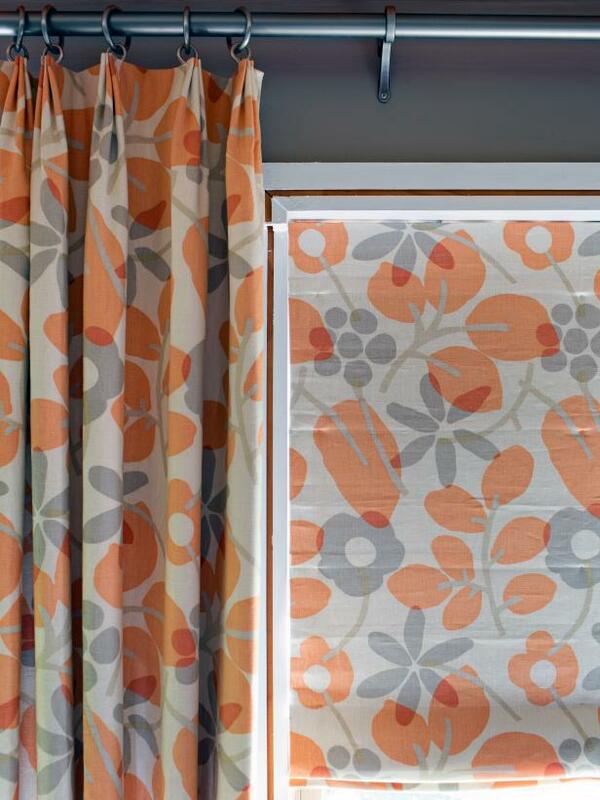 The couple liked a botanical print featuring orange and taupe accents for the custom drapery panels as well as the Roman shade. 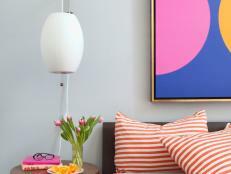 When spending money on the design for nurseries and/or children's rooms, it's wise to splurge on pieces that have longevity. 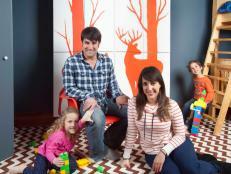 John and Sarah fell in love with the Cohen Glider from Oilo Studio, an Atlanta-based manufacturer of youth designer furniture. Its leather upholstery is easy to care for and durable, plus it can work just as well in the living room as it does in the nursery. Just a few inches from the glider sits the Murphy bed. 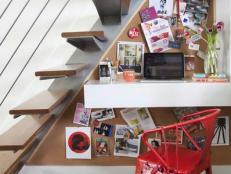 Originally, its exterior was covered in a red-toned wood laminate, something too adult and too formal for a nursery. 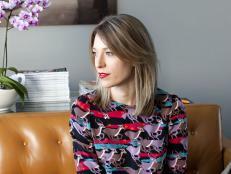 By updating it with custom vinyl wallcovering in the same palette as the room's decor, it now fits in perfectly, blending in with the other design elements. 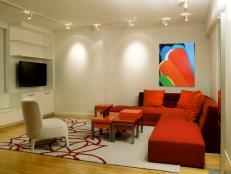 Although the Murphy bed was in perfect condition prior to the room's makeover, the finish of its wood veneer was ill-fitting for the rest of the design. 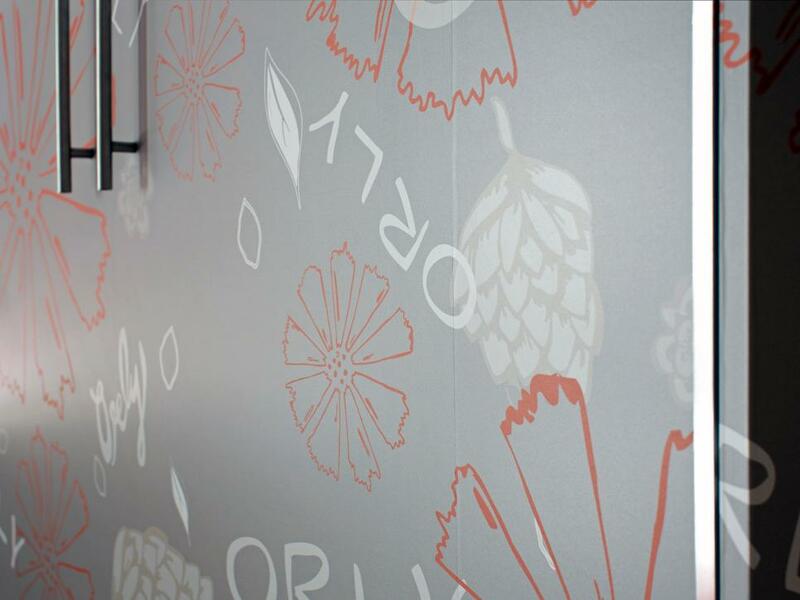 To give it a new look, custom vinyl wallcovering was created with Orly's name written in creative lettering. The self-adhesive vinyl needed to be cut to size then applied with a burnisher, which also helps get rid of air bubbles. 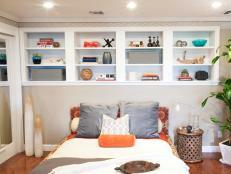 Once the crib is rolled out of the room and the rocker is slid to the opposite side near the closet, the Murphy bed can be pulled down, revealing a white, taupe and orange bedscape. 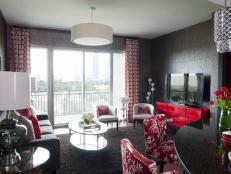 With the A/C unit just inches away, guests instantly feel as though they're staying at a New York City boutique hotel. 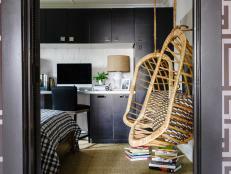 Children's rooms offer a chance to be playful, more so than in adult spaces such as lounges and living rooms. 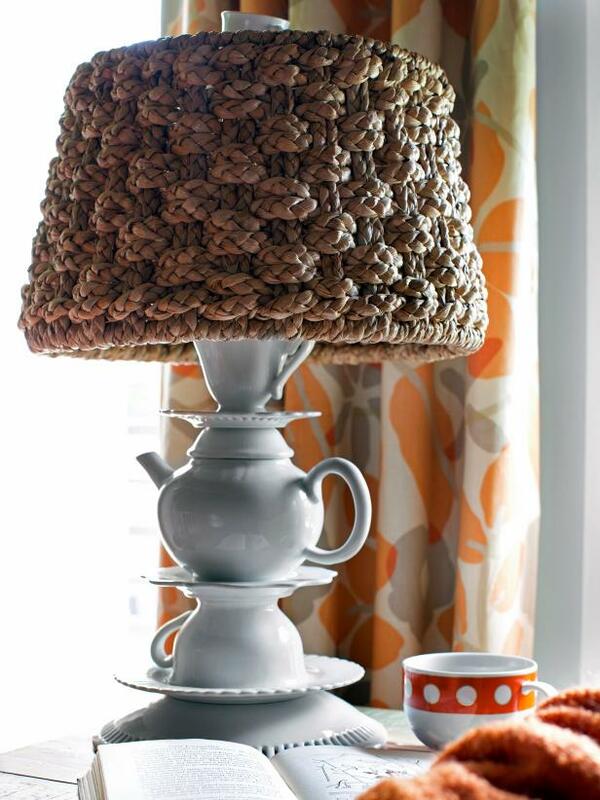 For a touch of whimsy, a table lamp made of stacked teapots with a woven seagrass shade is at home atop the side table next to Orly's rocker. The playfulness is appropriate for a nursery, and the organic shade fits perfectly with the all-natural aesthetic geared toward adult guests. 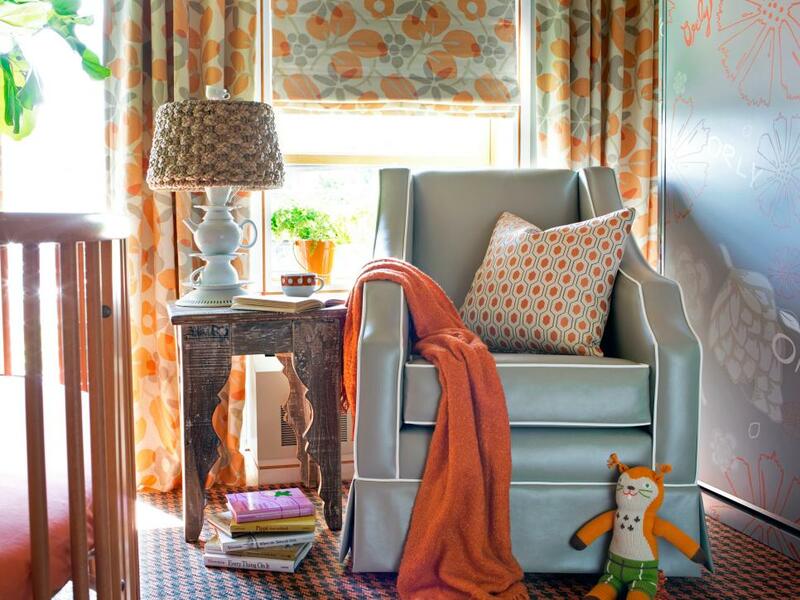 Keeping the nursery/guest room modular was one of the most important design elements to give it dual purposes. 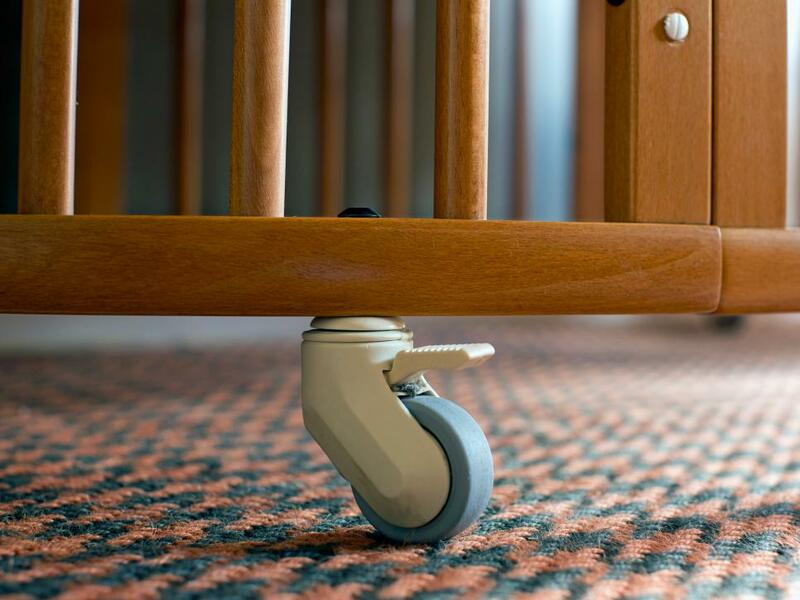 When the space is meant for overnight guests, Sarah and John simply roll Orly's crib, with casters attached to the bottom, across the hallway and into their master bedroom. 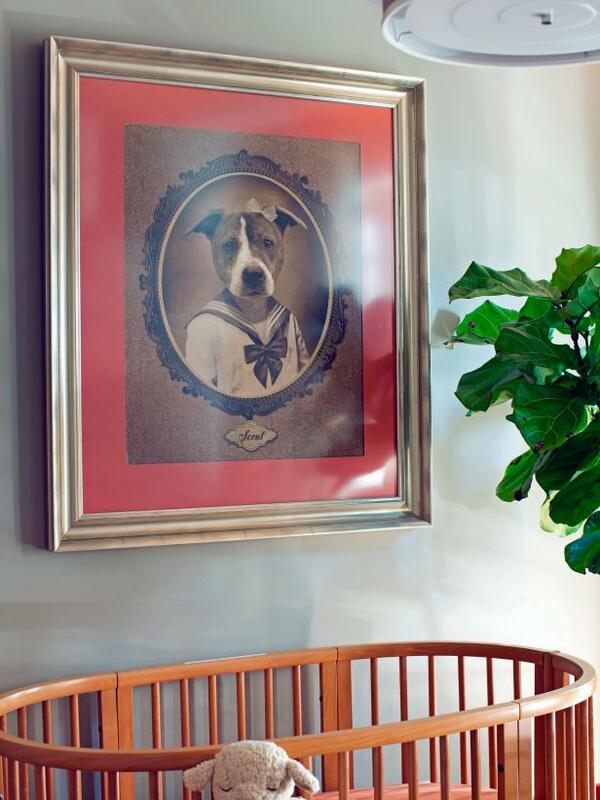 To honor John and Sarah's four-legged baby, their rescue dog Scout, a custom piece of art was framed with child-safe acrylic. For extra safety, the piece was attached directly into studs with a French cleat, making it impossible for Orly to knock it off the wall. 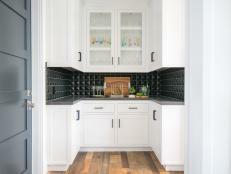 Instead of adding a basic changing table to the room, the couple used a lacquered faux-bamboo chest. The interior conceals all the baby changing necessities, and the top can easily swap identities from baby changing table to sophisticated console by removing the cushion from the top and outfitting it with personal keepsakes and a reading lamp. 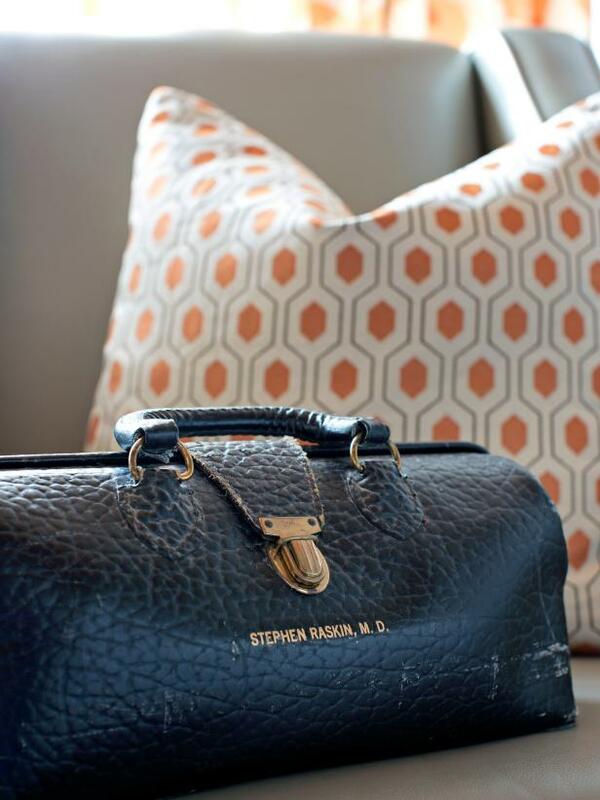 For an extra personal touch, they accessorized the room with a leather doctor bag, one that belonged to Sarah's father.